Planned Parenthood on Tuesday castigated President Donald Trump's intention to issue an executive order that would end automatic citizenship for the children of non-citizens who are born on U.S. soil, calling the plan "despicable" and "unconstitutional." "Eliminating #birthrightcitizenship would be incredibly harmful & is part of this [Trump] administration's radical, hateful agenda to stoke fear in our communities and contribute to many people's already very real fear of deportation," tweeted Planned Parenthood's nonprofit advocacy arm. The tweet came in response to reports that Trump intends to end the right to citizenship for the babies of illegal immigrants and other non-citizens who are born in the United States. This is not the first time this year that Planned Parenthood, the country's largest abortion provider, has been outspoken about issues concerning illegal immigrants. During Supreme Court Justice Brett Kavanaugh's confirmation process, Planned Parenthood opposed his nomination and accused him of restricting abortion rights. The organization cited his opinion in Azar v. Garza, a case in which Kavanaugh, as a judge on the U.S. Court of Appeals for the District of Columbia Circuit, argued against releasing a pregnant minor in the United States illegally from federal custody to undergo an abortion. The full court eventually ordered the government to release the minor to have an abortion. Kavanaugh dissented, criticizing the majority for creating "a new right for unlawful immigrant minors in U.S. Government detention to obtain immediate abortion on demand, thereby barring any Government efforts to expeditiously transfer the minors to their immigration sponsors before they make that momentous life decision." He also labeled the majority argument as "radically inconsistent with 40 years of Supreme Court precedent." The minor ultimately underwent an abortion, thanks in part to the activism of Planned Parenthood, which joined an amicus brief in the case. "At Planned Parenthood, we believe all people have a constitutional right to safe, legal abortion, regardless of their immigration status," the organization said in a statement at the time. "Brett Kavanaugh's nomination to the Supreme Court places access to abortion for undocumented women further at risk." Had the immigrant not had the abortion and remained in the United States, her child would have received birthright citizenship upon being born. 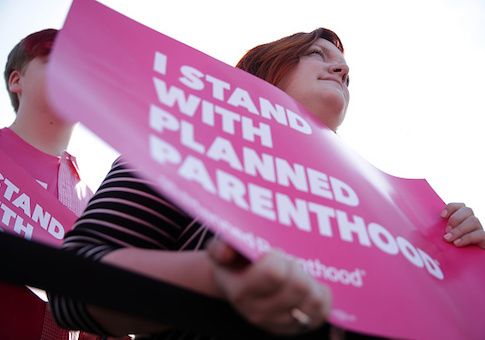 Planned Parenthood has made clear that it wants to be increasingly political. The organization's former president, Cecile Richards, recently said, "We aim to to be the largest kickbutt political organization." This entry was posted in Issues and tagged Abortion, Brett Kavanaugh, Donald Trump, Immigration, Planned Parenthood. Bookmark the permalink.